For a market that CRE professionals had crowned the nation's best for investment just two years ago, Seattle is slogging through a surprising sales slump. Chalk it up in great part to a head-turning slump in user demand just as a substantial wave of commercial development was coming online. Soured supply-and-demand fundamentals have claimed many a high-profile victim: the West Coast's tallest high-rise and a prolific Puget Sound commercial/multifamily developer among them. Perhaps most symbolic is the demise of locally-bred behemoth Washington Mutual: the nation's biggest-ever bank failure. As veteran local investment property broker Greg Laycock laments, real estate investors of all sizes and stripes have for the most part become reluctant to buy anything that isn't cash flowing. Hence as only a few owners are looking to sell solid performers amid depressed valuations, the Puget Sound region remains mired with "a dearth of inventory," as Laycock puts it. "We're seeing a few core-class urban properties trading" in Seattle and surrounds, but not a lot else, continues Laycock, a senior vice president with Grubb & Ellis Co. Some lenders are cutting their losses by foreclosing and listing small-cap REOs for sale, but many others are reluctant to dispose of distressed assets until tenant demand strengthens - and in turn investor interest. The fall has been downright frightening for what until very recently was one of the nation's most enviable local economies. 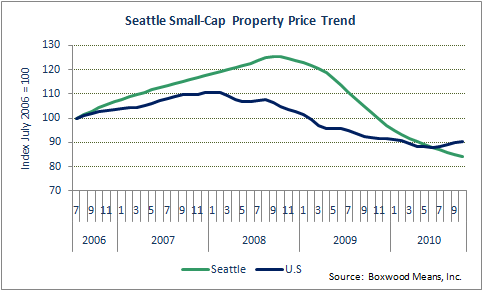 Seattle small-cap property sales prices are off 33.0 percent since the cyclical peak - well beyond the national average of 18.4 percent, Boxwood Means Inc. reports. Over the last three months ending October, Seattle small-cap property prices have shed 3.1 percent while the national market has risen 2.2 percent. It was barely two years ago that Seattle ranked No. 1 among the nation's 50 largest investment markets in the annual Emerging Trends in Real Estate report. But the marketplace fell all the way to eighth last year before rebounding a bit to sixth in the most recent survey. While local construction loan delinquencies have improved since hitting 37 percent a year ago, the Seattle vicinity's mid-year rate of 28.4 percent was the highest among major metro areas, according to Foresight Analytics. Weak fundamentals ultimately required a fund managed by Beacon Capital Partners to restructure its $380 million conduit mortgage on downtown's 1.5 million-square-foot Columbia Center tower - which is now reportedly worth hardly half the $648 million at which it was appraised in 2007. Meanwhile, prominent local developer Mike Mastro's empire has come crashing down amid a massive bankruptcy and related litigation. And of course it doesn't help the local office market's cause to see mega-tenant WaMu pretty much implode. With office and retail user demand still so anemic - and with banks still very conservative when it comes to underwriting purchase mortgages - investor demand remains sluggish at best for anything but high-quality, well-tenanted commercial properties. "The amount of equity lenders are requiring with local office and retail properties means a lot of (prospective) deals are non-starters," Laycock laments. That's especially the case with the abundance of properties listed in the $3 million to $5 million asking-price range. The new cash requirement is a lot more than many local entrepreneurial types can round up in a hurry - and, again, banks aren't providing a lot of proceeds today for vacancy-challenged or even stabilized properties. But that's a common profile among the relatively few small-cap properties that owners are looking to sell these days. For instance, Laycock's colleagues at Grubb are seeking buyers for fully-occupied strip shopping centers in Federal Way and Snohomish, both listed at just under $4 million (the former at a 7 cap, the latter an 8). Laycock's own for-sale listings are also in that price vicinity: a well-leased 46-unit garden-style apartment complex in Tukwila listed at $4.2 million; and a fully occupied 12,000-square-foot low-rise office building in Bellevue listed at $3.65 million. Laycock, traditionally a prolific apartment broker, isn't seeing much business from his multifamily clients these days amid uncertainty over the local marketplace's direction. Again, some core-quality assets have traded, but activity in traditional $2.5 million Class B properties remains at a low ebb, he acknowledges. Nor are entitled development sites exactly commanding a lot of attention in this environment. But on a somewhat brighter note, industrial users - and in some cases investors with users in tow - have been showing greater interest in properties available at attractive prices. "You've got a much better chance of selling if you can find an owner-user for an industrial property," Laycock relates. Nevertheless, the area is seeing some indication of better office and retail conditions ahead. Homegrown brokerage GVA Kidder Mathews reports that retail vacancies appear to have peaked at a bit above 6.5 percent (not including leased-but-dark spaces), and that rental rates are now back into stabilization mode. Absorption was break-even during the first half, but could be positive for the year to the tune of perhaps 1 million feet. As for the office sector, the third quarter saw the first improvement in the market's overall occupancy rate in two years - with direct vacancies still around 13.2 percent and total availability at nearly 16.5 percent. Although effective rents haven't yet stopped declining, net office space absorption is at least modestly positive. Even the Emerging Trends report suggests imminent recovery: the investment outlook characterized as only "fair" a year ago was upgraded to "modestly good" in the latest release.